I have thought about this project off and on for the last 3 years. But I never took it seriously because I felt Oscar and I provided enough information over the years in our forum posts and ELI videos for most people to defend themselves. However, that is simply not the case for many new people. Oscar and I continue to get private emails from people asking us what to do. Despite the large number of posts over the years, many people want more structured guidance. I have finally decided to commit to this project. Unlike the ELI Forums, this Special Report will NOT be FREE. I am taking the time to painstakingly assemble and write this report in a detailed manual format. And because this will be a paid product, I will be writing and sharing ideas and thoughts I have never posted publicly (and I have definitely posted and shared a lot over the years). Personally, I feel the ELI forums and the ELI videos are more than enough to get started. Nevertheless, this special report is for those people who want information on a “silver platter” without having to search or research the ELI Forums. This special report will not be available anywhere else except through the ELI website where I will personally monitor and fulfill each and every order. When will this special report be completed? It is difficult to say since this is a side-project as I have spare time. But I hope to release this before the end of April 2012. How much will this cost? It isn’t finalized yet. I am guessing it will between $25-$45 all of which goes toward supporting ELI. Should I buy a copy? Yes! 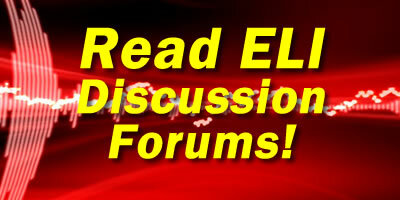 Although much of the information is available on the ELI Forums, there will be quite a bit of commentary that is not publicly available. The special report will be in a 8.5″x11″ manual format that you can print out on your printer and place into a 3-ring binder. More importantly, I am giving you an excuse to make a contribution to the ELI website. To continue actively expanding ELI, Paypal Contributions help a lot! I will be releasing more updates as I progress. However, I am open to suggestions as to what you would like to see in this special report. This special report will probably be updated at least twice a year to reflect the newest information.